We were on a spell-based Hunter kick a little over a month ago, and while most of those decks are old news by now, we enter this week with a legend caliber aggressive list that gets back to the damage you know and love. Hunter is in an odd spot because, for the first time in years, there are many different ways to play the class. This week's deck is interesting because it combines a bunch of different tools and pulls them together to create a very fast midrange build. You may recognize some of the cards here today, but they aren't used in the way you're typically familiar with. Snake Trap This card is easily my favorite part of this build. 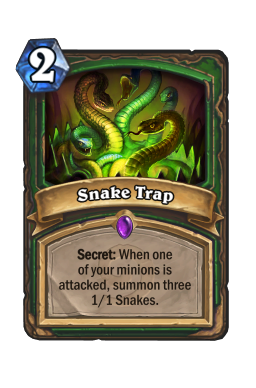 There are a ton of secrets in the current meta, and while many people will play around things like Wandering Monster or Cat Trick , they are going to dive headfirst into Snake Trap . This card isn't just a strong tool, it is an absolute blow out when your opponent doesn't see it coming. As Wandering Monster is so popular, many people will avoid attacking into your face if they can avoid it, opting for the trade instead. That means this constantly triggers during the early turns of the game. That then gives you the board as well as three small beasts that you can freely tweak and use in anyway you like. Always plan as if you're getting the 1/1's and make your plays accordingly. That is the best way to get value from the spell. The other reason trap is so good here is because your opponent needs to deal with your board. You are almost always going to be the aggressor, which puts a lot of stress on your opponent to clear your minions. 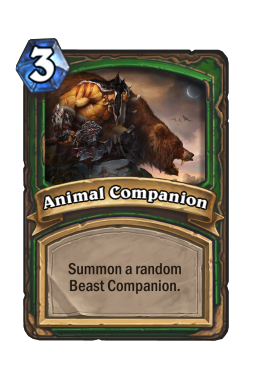 While you can ignore some classes, nobody is going to allow Hunter to have minions for more than a turn if they can help it. For that reason, you always want to try to hit trap into a situation where it is going to go off. 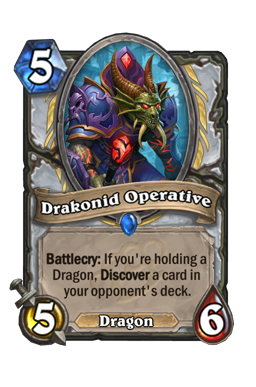 The tricky part about this card is that if your opponent does guess correctly they will be able to easily play around it. 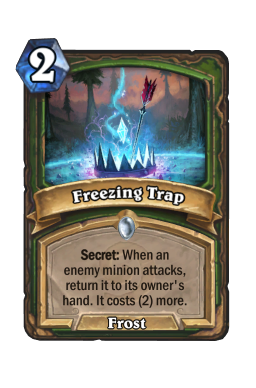 You can never let anyone know this is coming, which means putting it up when your opponent has to trade or when you're bluffing something like Freezing Trap . Crackling Razormaw Crackling Razormaw has been a strong Hunter card since it first came out, and it is a centerpiece with what we're trying to do here. At first glance, there are not a lot of beasts in this deck. While you still have the easy intro of one drop into Razormaw, that isn't something that is going to be sustainable over long periods of time. Rather, you need to figure out ways where you can get value from the two drop without ruining your curve. 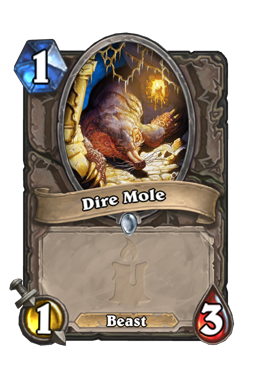 Sneaking this out alongside a turn five Animal Companion or turn three Dire Mole is usually how this goes to go off. There is a very small window where Razormaw is strong, and that means you always need to watch for it. Missing one key turn often means you're never getting the value you want. 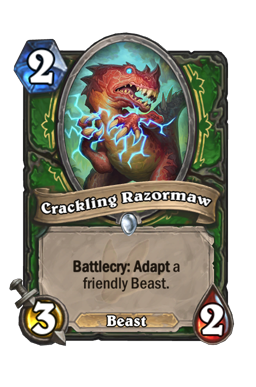 The other reason we need to discuss Crackling Razormaw is because it shows the importance of a good curve in this build. When piloting this list you never want to think about missed opportunities. Yes, you may have some insane synergy or strong mini-combo, but that is rarely more important than sticking to your mana or prioritizing damage. The goal of this build is to press the early advantage and then run your opponent over in a stampede of beasts. That often means there are cards you will never play or get to use. You may want to drop down your razormaw on turn three or four to get "value," but those avenues are never worth it unless there is a specific reason you have to take them. It is almost always better to efficiently use your mana than it is to make the synergistic play. Cloaked Huntress Another insanely powerful part of this build, Cloaked Huntress is one of the best tempo cards in the game. As with any Midrange Hunter list, your goal here is to get ahead of your opponent in any way possible. As soon as you stick a big body you can start pushing for face, which helps further your goal of making it so that your opponent can never catch up. 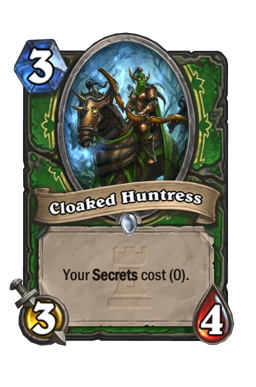 Huntress is a big part of that plan because a 3/4 alongside a few free secrets is crippling against other fast decks. You would always like to hit her with Cat Trick , but a lot of the time you're just trying to find any type of value you can. The only thing I will say is, and this comes up a lot, but don't get greedy. 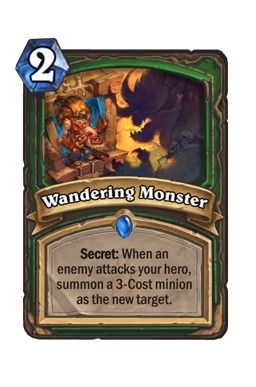 I see many people trying to hoard secrets to have the ultimate secret turn, but, as mentioned above, you don't want to waste mana or go off your curve if you don't have to. 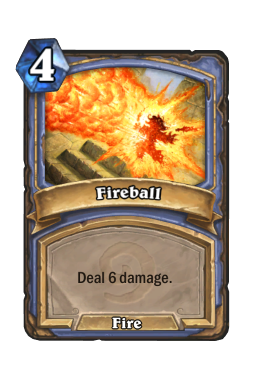 A vanilla 3/4 for three may not bring the house down, but it is both damage and board presence. Remember, as your opponent is going to answer you, everything is a threat. Playing a secret on two is still fine when you have Huntress on turn three. The only exception to that rule is when you're trying to set up Snake Trap in a way where you don't want to tip your opponent off. Spellbreaker We once again find ourselves discussing the four drop. 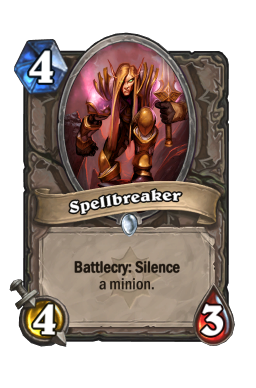 Spellbreaker is a card that has not just become popular, it is quickly becoming an auto-include. Warlock is incredibly powerful, and not having a silence can lead to a quick loss. That is especially true of faster decks like this one. 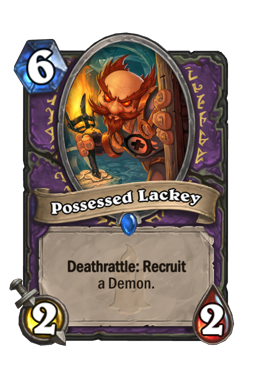 However, Warlock is not the only class you're going to face on ladder. You have to be ready to use this against all decks, which means you always want to have a target in mind. Silence is a powerful tool, but how you use it constantly going to change. 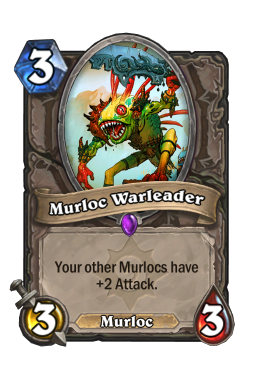 Taunts are always your first priority, but cards like Possessed Lackey and Murloc Warleader come up quite often as well. Do not get complacent when using Spellbreaker . It is very easy to fall into "something worse is coming" trap where you hold this back in fear of some gigantic threat, but, unless you're up against Gul'dan, that is typically the wrong. You cannot waste turns in this list. In most classes, you want to hold back Spellbreaker and only use it when you are trying to set up lethal. 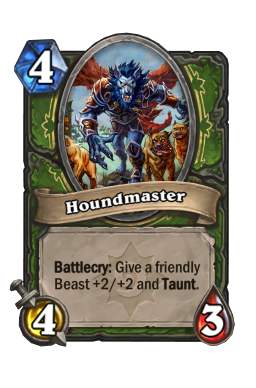 That is not necessary true in Hunter because, unlike other lists, you have a reliable way to go above taunts. Waiting just isn't worth it because by the time you can use this, you will have already missed out on a quite of bit of damage. This card is strong, and makes a decent four drop against non-Warlock decks when you have nothing to do. Yes, playing it with no target feels bad, but four attack is something your opponent will pay attention to. Clearing vs. Damage I'm not sure if I've grown more inquisitive in my old age, but I find myself doing more general deck theory overviews in my guides as of late. This week, I wanted to discuss the importance of damage in a deck like this. Yes, you need to go face and put on constant pressure as best you can. However, you also want to protect your minions and set up the board. Finding the balance between those two elements is extremely tricky and not something that is going to be easy to do. There are some games where using Kill Command on the board leads to victory, but there are also games where trading with your Eaglehorn Bow leads to a loss. The general rule that governs trading vs. face is that you only want to trade on the board when it either represents tempo, stops lethal, or protects an investment. Remember that minions are inherently more powerful than weapons and spells because they can (in theory) attack multiple times. For that reason, using an Eaglehorn Bow to take out a 3/3 against your Houndmaster is a great deal because the master is worth four damage (more than bow) plus an extra four each turn it lives. Also, don't forget about taunts. You can go above them in a few ways, but if you're depending on the board for your damage you need to push as much as you can. It is never easy to choose your path, and it will differ in each game, but the general rule is to go for damage and only shift away when you have to push tempo on the board. The four decks I see the most while playing the ladder. Control Warlock With Witchwood on the horizon, I don't think we're going to shift in power until rotation. That means Warlock will likely remain at number one. The class is quite strong, but it is also extremely vulnerable to fast damage. The way you win this is, first and foremost, by killing your opponent around turn five. Even if you have a Spellbreaker , you cannot depend on the four drop moving into the later rounds because your opponent has so many ways to heal or taunt up that they can bounce back at any time. Do not get complacent here. You have a very short window in this game, and you need to hit it when it comes. Push the early board as much as possible and do everything you can to set your opponent into tough situations. Remember, they want to tap during the first few turns of the game. 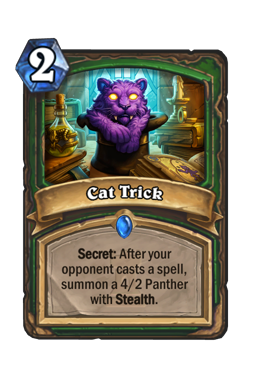 If you can set up things like Cat Trick or work in big bodied threats like Cloaked Huntress , your opponent will never be able to properly set up before they die to burn. A general rule when fighting Warlock is that you almost never want to focus on their board. It can feel right to try to and pace the game so that you control the trades, but every turn spent killing something is a turn not spent attacking your opponent's face. 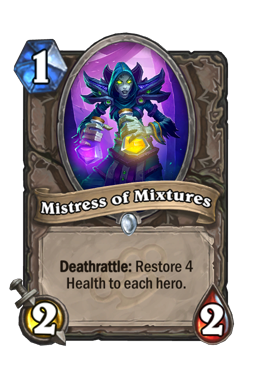 The only card you want to be wary of is Mistress of Mixtures . A one mana 2/2 is a bit of a problem and you should try to take her out as cleanly as possible. 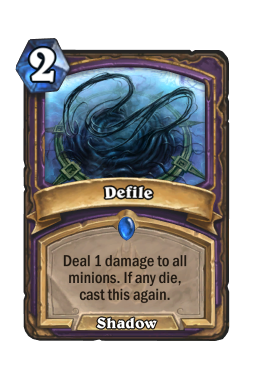 In addition, it is also important to play around Defile . 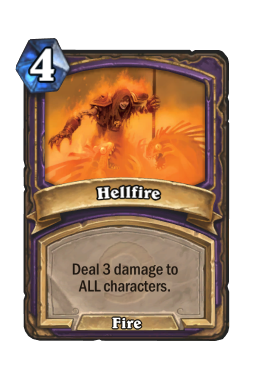 Hellfire is Warlock's only true early game AOE, and that comes at a massive price of three health. Allowing them to set up Defile is one of the only ways they can get to turn five at a reasonable amount of life. Constantly count the health of your minions and make sure it isn't stacked 1-2-3. 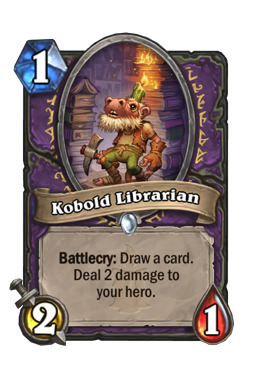 Also note that, even if you don't have a one health minion out, Kobold Librarian can come in and ruin the party. Aggro Paladin I find that, though there are many good "go big" decks running around, Paladin is still our toughest matchup. The reason for that is their minions stack up well against our board, which makes their early push incredibly powerful. If you can get ahead of them, you will likely come out on top, but even then they have a lot of ways to push back here. 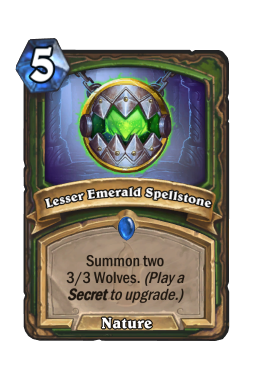 The two most important cards in this one are Houndmaster and Lesser Emerald Spellstone . 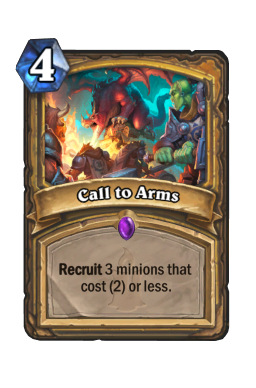 Not only do both cards come down around turn four (which allows them to push back against Call to Arms ) but they also press a lot of damage. Paladin is often a three turn match, which means it is a game that takes place over the first three turns. You and your opponent fight for the board, and whoever comes out on top starts being aggressive and runs the other one down. 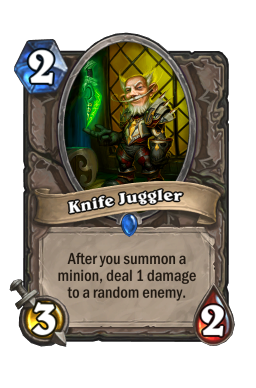 Those two cards are what help you find lethal and once you get them out, push for damage (unless you need to kill a Knife Juggler ). Snake Trap is easily your best card in this one. Three 1/1's just ruin Paladin's day, especially when they're trying to make a push to Call to Arms . You want to aggressively mulligan for your one drops and the secret, and you want to slam trap as soon as you can. It does not matter what the board state is like or the minion count, there is no doubt that your opponent is going to attack your board. Beyond that, your overall goal is to grind your opponent down. Trade aggressively during the early turns and always find the tempo plays when possible. As mentioned above, damage is important, but you need to set up a big platform for that damage to work. Always take down murlocs and do not worry about taking an extra turn off to fully take out your opponent's board. As soon as you stick one large threat ahead of Paladin, the game is over. Big Spell Priest Priest still loves their minions, and they should enjoy them while they can. This game is a fight for the board on all sides, which makes it one of the more interesting matchups around. The overall game plan in this one is to set your board in a way where your opponent cannot easily respond to it. Remember, most Priests these days don't run spells, which leaves them vulnerable to single threats. 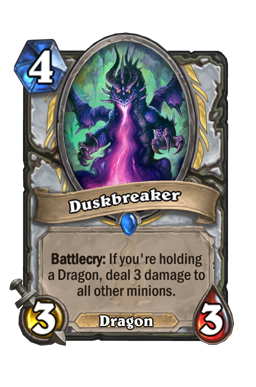 Yes, Duskbreaker crushes Lesser Emerald Spellstone , but it is unlikely your opponent is going to be able to do anything about a single Houndmaster ed threat or the like. That's your advantage in this game, and you need to press it as much as you possibly can. The goal of this game is to run your opponent off the board early (do not be afraid to trade) and then get them into a situation where they cannot afford to play their game. 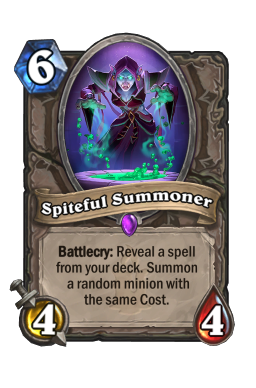 For example, while they may want to slam down a turn six Spiteful Summoner , the six drop isn't going to protect them from damage. Some people will still roll the 4/4 in those situations, and that's exactly what you want. If they test you, you punish them with your burst. Secret Mage Despite this week's deck, Hunter has slipped away on the ladder in favorite of Secret Mage. This matchup is not an easy one, but it is also quite winnable if you can get out early enough. Your goal of this game is two-fold. The first part is ensuring that your opponent can never leverage their burn on your face. That rule has been in place since the dawn of time, and it's still true to this day. Mage doesn't want to fight for the board. They want you to fight for the board while they hoard up burn. If you can get them to use that precious burn on your board, then you really pressure them with things like Steady Shot and Eaglehorn Bow . Beyond that, your goal is to make sure your opponent does not get full value from their secrets. 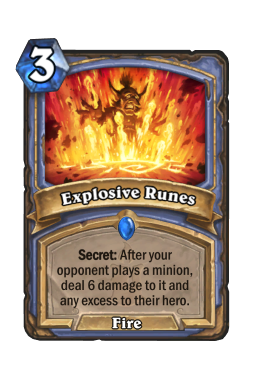 Counterspell and Explosive Runes are the only two you truly need to play around, but you absolutely need to play around both. Taking a lot of damage off of runes can hurt, but it is almost always the right play here. You should try to save a cheap minion for it when possible. 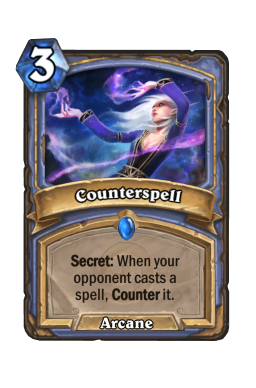 On the other hand, counterspell hurts quite a bit. Do your best to save the coin or, if that isn't an option, a cheap secret that doesn't matter all that much in the long run. This game is a lot like Paladin in that you want to go back-and-forth for the first three or four turns before leveraging damage and taking down your opponent before they can get properly set. Anytime you get the board, you have to push face. One drops? One drops. Mulliganing with this deck is the same mulligan you're going to see in all midrange or aggressive Hunter builds, which means you start fast and end faster. Secretkeeper, Alleycat, Dire Mole, Crackling Razormaw, and all your secrets are your must-keeps. However, I am not a huge fan of keeping a whole hand of secrets with no minions. One is great without the coin and two is fantastic with it. Of course, that changes if you have Cloaked Huntress, but that's the general rule. Beyond the must-keeps, you want to look for Cloaked Huntress , Eaglehorn Bow , and Animal Companion with the coin or a good curve. Spellbreaker is incredible against Warlock but, along with Houndmaster , it can also be kept to top off a strong curve. 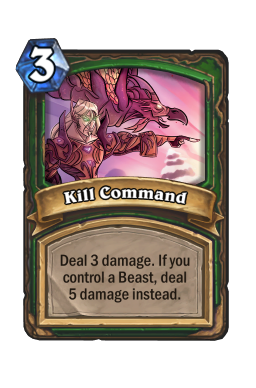 I am not sure what the future holds for Rexxar (some big wonky 10 mana dragon probably) but the class still has its hits. This list blends a lot of cool cards together, and that keeps things fun. 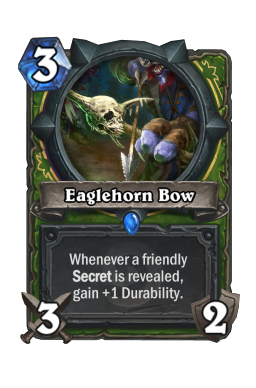 I've always been a fan of the secret package, and I've always enjoyed the pacing of Midrange Hunter decks. Getting to do both with a noticeably aggressive slant is a nice shift and one I welcome before rotation. Witchwood is coming guys, but there's definitely some laddering to do before then. Until next time, may you always Huntress into three secrets.